Channel Island English refers to Alderney English, Guernsey English and Jersey English and similar dialects of English found in the other Channel Islands. Alderney English is the dialect of English spoken in Alderney, distinguished by the fact that it has considerable influence from Auregnais, the variety of Norman spoken on the island. Differences from more standard English include vraic (seaweed fertiliser), and the pronunciation of certain local surnames, Dupont and Simon as [dipõ] and [symõ] respectively, rather than the standard Parisian pronunciation. 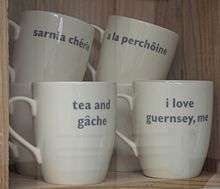 It is in many ways similar to Guernsey English, as Guernésiais and Auregnais differ only slightly. Guernsey English is the dialect of English spoken in Guernsey, distinguished by the fact that it has considerable influence from Guernésiais, the variety of Norman indigenous to Guernsey. The dialect contains terms such as "buncho" (from Dgèrnésiais: bond d'tchu) for the English "somersault"; "it picks" instead of "it stings", from the Guernsey equivalent of the French "il pique"; "chirry" for "goodbye"; and "Budlo Night" instead of Bonfire Night on November 5. Often Guernsey people will add the word "Eh" to the end of a sentence, inferring a general agreement that something is held to be true or correct. It can also be used in the context of asking a question or to seek reassurance that what was said is correct if it is believed to be a contentious issue. Jersey English is a dialect of English spoken in Jersey, Channel Islands, the accent of which has been likened to that of South African English. It is influenced by the use of Jèrriais and Jersey Legal French. Jersey English has imported a number of Jersey Legal French titles and terminology. Many of these, in turn, derive from Jèrriais. The following are examples likely to be encountered in daily life and in news reports in Jersey: rapporteur, en défaut (in default, i.e. late for a meeting), en désastre, au greffe, greffier (clerk-of-Court or the States), bâtonnier (lawyer in charge of Bar, particularly for legal aid), mandataire, autorisé (returning officer at elections, or other functions), projet (parliamentary bill), vraic, côtil, temps passé (time past), vin d'honneur (municipal or official reception), Centenier, Vingtenier, Chef de Police (senior Centenier), branchage (pronounced in English as the Jèrriais cognate even though spelt in the French manner - trimming hedges and verges on property border; also used jocularly for a haircut), Seigneur (feudal lord of the manor). R tends to be uvular in the island of Sark, and trilled throughout the archipelago. /t/ and /d/ are dental and unaspirated. Interference from the Norman Languages caused their intonation and word stress to be different sometimes, like edu'cated, Liver'pool and rail'way. The Norman Influence is more clearly demonstrable in Channel Island English morphosyntax than in its phonology. “That's the one, eh?” Eh for “isn't it?”, “aren't they?”, “don't you think?”, or else.